It’s such a treat to get date nights out, even if we’re keeping things low-key with the actual date itself. Jordan and I both love the dynamic of our family now, but it’s an adjustment on your marriage and the time you spend together is SO important. We try to get a night together at least every other week, and it’s usually sporadic so some weeks are easier than others. We’re also big fans of traveling together (just the two of us) and I know that’ll be a priority for us both as we grow our family, but that doesn’t mean that quality time isn’t needed between those special dates. At-home date nights can be as elaborate or simple as you want. I think the best dates happen when you relax, connect, and enjoy the evening whether you’re in a beautiful restaurant by the water or in a sticky booth inhaling queso and chips. This is the same concept - some nights may be a little fancy, and others may be super casual. For us, the perfect night-in includes wine, a darn good show on Netflix, and perfectly-cooked steaks. But because I wanted this to be an after-B-goes-to-sleep activity, I kicked it up a notch with a charcuterie board from a fantastic new business that’s local to us - Boards in Wichita. It’s so similar to food we would’ve had in Sonoma where we got married, and we paired it with a really amazing red wine. Such a treat! This board had some amazing local foods like honey from Murphy Family Ranch in Augusta, KS, and micro-greens and organic Marigolds (that are totally edible by the way!) from Kan-Grow Hydro Farm in Wichita, KS. The board itself is even locally made by JW Craftsman! They also come in Vegan and Vegetarian options - you can check out their full website with more info here. I LOVED how this board was put together. Everything on the board worked so well, and even the fruit was perfectly ripe and had amazing flavor. Aside from the fact that it looked gorgeous, it tasted even better than I expected! Try a new location: We like hanging out on the deck when the weather’s nice (complete with string lights - so romantic and cozy!) 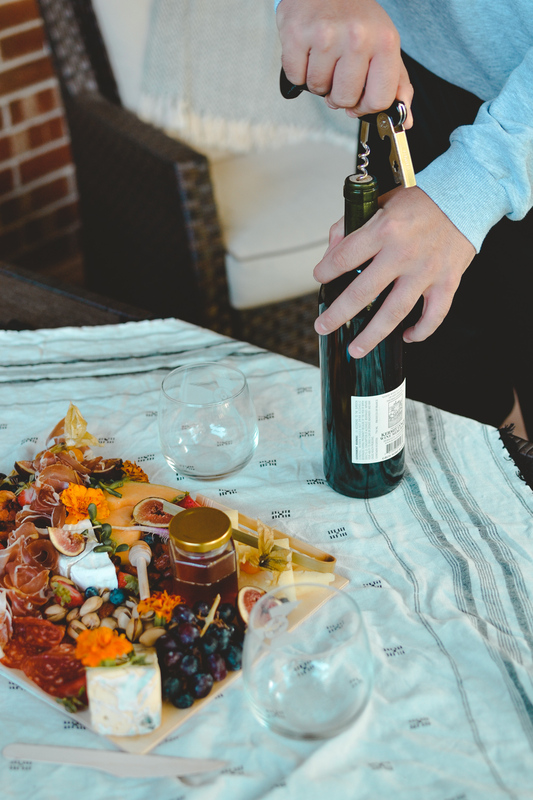 If it’s too hot or cold to be outside, try making a picnic on the floor in your living room for something a little different. 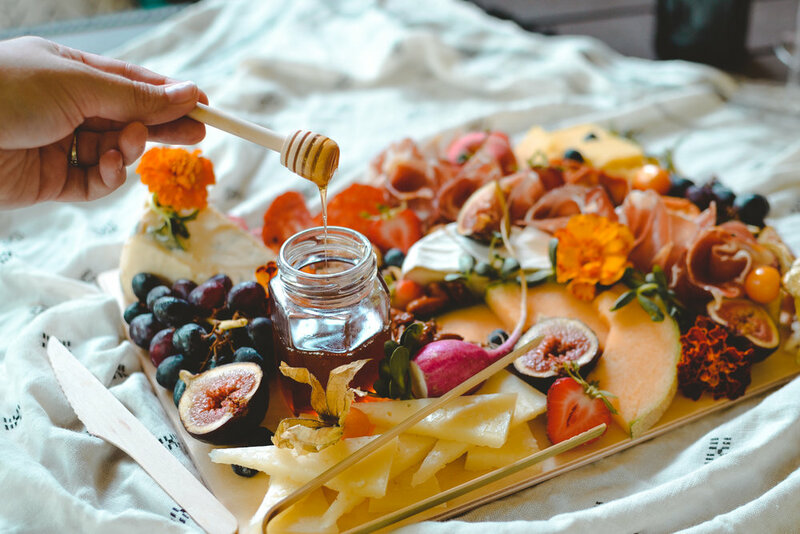 Bring home a treat: This charcuterie board is something we would’ve had in Sonoma, and I love that special detail. Another fun idea is trying takeout from somewhere new and taking it out of the styrofoam to eat on nice plates. Or pick-up a fancy dessert for you to share after the kids are asleep.